Note: you can use any size hook and any colors for this. Materials listed here are for the afghan most of you seem to be looking for. 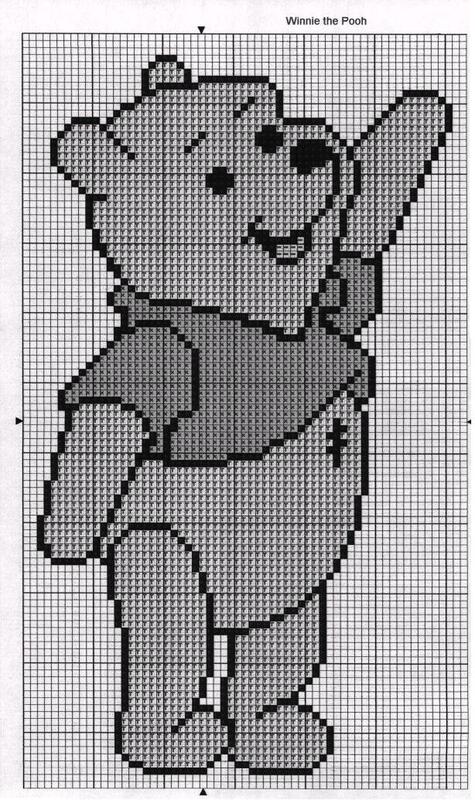 DIRECTIONS: Print Pooh chart. Start by chaining number of boxes across chart + 1, sc in each ch across, ch 1, turn. Sc across in each subsequent row. Follow color changes on chart. Color changes are made by working stitch before color change to last step (2 loops on the hook), with new color complete the stitch. Work over color(s) not being used. I have only started making this pattern so I am not sure about the gauge, needle size, etc. To add to the length of the afghan, increase the number of sc rows before and after you begin the Pooh pattern. To add to the width of the afghan, increase the number of ch st to the desired width and then add an equal number of sc to each side of the Pooh pattern.